With so many players getting into Fortnite, it makes sense that some people would want to make money off the game. Unfortunately, many who do this choose to do so by stealing other people's accounts. If you've built up a nice account with tons of skins and achievements, don't risk losing it! Enable 2 factor authentication to make sure your account is 100% secure. Fortnite 2FA is Epic's version of two-factor authentication. Don't be fooled by the name - it's basically the same type of two-factor authentication used by games and apps across the internet. In the simplest possible language, it's an extra layer of security that helps to protect Epic accounts. Through requiring users to use an extra device or application in order to log in, Epic helps to cut down on the possibility of accounts being accessed by malicious third parties. 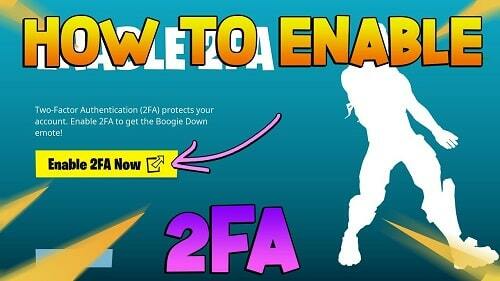 How Does Fortnite's 2FA Work? Fortnite's two-factor authentication works in the same way that most two-factor authentication tools work. When you make any major changes to your account, be it through spending money or making transfers, you'll be asked to pass through the second layer of security. This comes in the form of a randomly generated code that is sent either to your authentication device or to your email. Once you have access to the code, you can enter it into the prompt and make the changes you wish without putting your account at risk. How Do You Turn 2FA On? Enabling 2FA is actually fairly straightforward. Your first step will always be to go to Epic's site(https://www.epicgames.com/fortnite/en-US/news/2fa) and access your account with your current username and password. From there, you'll go to Passwords and Security, then scroll down until you reach the options for two-factor authentication. Turning on two-factor authentication will require making a choice between using an authenticator app or using your email. You don't actually have to download any kind of Fortnite authenticator for this process - virtually any authenticator that will let you add accounts works for the game. Once you get your app set up, you'll click 'Enable Authenticator' on your account page. Once you see a QR code, you can scan it into your authenticator and type in your new six-digit code. If you don't feel like using an authenticator, you can still use your email. Follow the same steps as above, but choose to enter your email address as your authentication method. You will get an email from Epic, which will give you a six-digit code. Once you have this, you can enable two-factor authentication on your page. The best reason to use Fortnite's 2FA feature is that it allows you a bit of extra security on your account. Given the popularity of Fortnite - and the money to be made on the secondary skin market - it's only reasonable to assume that there are a number of people who might want access to your account. While Fortnite's security is fine, it's still relatively easy for a motivated party to access your account once he or she knows your user name. The two-factor authentication simply makes it harder for unsavory individuals to cause you harm. Another reason to get 2FA is that Epic now requires it if you want to compete in any of their tournaments. This would only apply to the top 1-2% of all players but if you want to play competitively, 2FA is not optional. Given that using Fortnite 2FA takes a little bit of effort, it makes sense that most users would want some kind of benefits for using the program. The good news, at least for those on the competitive level, is that 2FA functions as a key to higher-level tournaments. If you're interested in the absolute top levels of play in the game, you've got to use 2FA. This isn't the only benefit to using two-factor authentication, though. Epic has already released one free emote for players who use authentication, and it seems very likely that the company will continue to entice players by giving away free stuff. At the moment, the emote is the only extra that you'll get when you enable two-factor authentication insofar as Battle Royale is concerned (a few others available in Save the World), but it wouldn't be out of the ordinary for Epic to continue to lock more content and more freebies behind that gate. After all, it's a tool that protects the company just as much as it protects players, so it's in Epic's best interest to see wide-spread adoption of the technology. How Does 2FA Stop Your Account From Getting Hacked? The truth about password-protected accounts is that they're relatively easy to access if a user is motivated enough. Once you know a username, it doesn't take very sophisticated tools to brute-force a password. If a username has already been involved in a security breach, it's even easier because there's a good chance that the password has already been revealed as well. 2FA helps to make the process more difficult by creating a randomized, time-sensitive key that's required to access the account. If the person trying to access the account doesn't have access to the authenticator or account email address, accessing the account becomes if not impossible, then certainly very improbable. Choosing to use two-factor authentication is one of the best ways that Fortnite players can protect their own accounts. It not only gives you more control over who gets access, but it makes it much harder for bad actors to get your information. There's really no good reason to avoid using two-factor authentication, so make sure that you enable it today. Previous How Much Data Does Fortnite Use? Every month we give away 1,000 V-BUCKS! Enter your email address to enter our monthly giveaway!